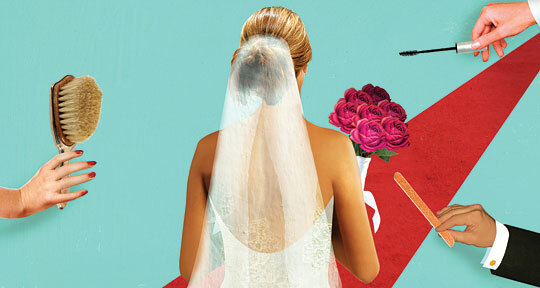 Try this: The Complete Ceremony conditioning treatment ($75) at Michael Angelo’s Wonderland (418 W. 13th St., nr. Ninth Ave.; 212-524-2800) will knock the Don King right out of your hair. Angelo, a fashion-industry vet (he’s done Vogue editorials and styled the likes of Beyoncé, Brooklyn Decker, and Lydia Hearst), will take wedding details into account (location, potential humidity, etc.) before customizing your frizz-fighting regimen, which will last up to ten washes but should be done a day or two before the wedding for the best results. Styling starts at $125. Try this: Nail-gnawers, take heart. The manicurists at this luxe salon (112 Reade St., nr. W. Broadway, second fl. ; 212-406-1010) are seasoned pros when it comes to nursing damaged nails back to health. Co-founder Nadine Ferber recommends four weeks of treatment at $20 per manicure. Manis are given over a marble-slab table, and iPads are on hand so brides-to-be can finalize wedding details while waiting for their polish to dry. Clients can choose from an array of upmarket brands, including Chanel, Uslu Airlines, and fashion-magazine favorite RGB. Try this: Relax with a glass of Sauvignon Blanc while Meredith Fish, the owner of the sunless-bronzing company Brownberry, smoothes out your farmer tan or swimsuit lines from the comfort of her Soho apartment (195 Spring St., nr. Sullivan St.; 917-612-5814). She’ll also come to you in a pinch. Brownberry’s paraben-free custom solution smells faintly of Bond No. 9 and goes on clear—so there’s no risk of it rubbing off on your white gown ($90; rate negotiable for bridal parties). Try this: Dr. Gilman, a respected dermatologist who has appeared on MSNBC and The Dr. Oz Show, treats last-minute pimples with quick cortisone injections ($200–$300) at her recently renovated Upper East Side office (328 E. 75th St., nr. First Ave., Ste. A; 212-772-1717); the offending zits should simmer down within twelve hours. For glowing, aisle-ready skin, she also offers a light chemical peel ($200–$300) that’s gentle enough to do right before the big day. Try this: The 60- to 90-minute eyelash-extension procedure at JJ Eyelashes (56 W. 56th St., nr. Sixth Ave., second fl. ; 212-244-2921) allows clients to customize length, thickness, and curl. The luxurious extensions last for three to six weeks, and you’ll be treated to a foot massage during the application. From $120. Try this: The Purify & Control facial ($125) at Fresh (57 Spring St., nr. Lafayette St.; 212-925-0099) might just be the best deal in town. It features Umbrian clay, an anti-inflammatory that extracts toxins and excess oil without inducing breakouts, and you get to redeem the cost of your treatment in products. Ask for Diana, who administers a soothing arm massage while you wait for your mask to dry. Try this: Take the wince out of waxing with Uni K’s all-natural formula, made of pine sap, beeswax, and aloe and applied at normal body temperature. The brand’s new uptown outpost (1626 Third Ave., nr. 92nd St.; 212-369-6888) offers more than a dozen packages, including a full leg, underarm, and bikini wax for $85, as well as à la carte options ($16 for eyebrows).